Like many others who attended SMACC earlier this year I returned home dazed and confused about the significance of lactate in the septic patient. So like any good (aspiring to be) evidence-based medicine practitioner, I started the search engines to find out what exactly everyone was on about. Consider this post in two halves. The first section revises what I (you?) think we were taught and the second section challenges that view and asks some fundamental questions about what we mean by a raised lactate. Lactate was discovered/identified in sour milk by Carl Wilhelm Scheele (in 1780! ), who had an unlucky career, in which most of what he discovered (including oxygen!) was credited to others. Joseph Scherer then went on to identify its presence in the blood of a young lady who died (likely from septic shock). Carl Folwarczny subsequently demonstrated its existence in the blood of a living human, before Araki and Zillessen noted the association between tissue hypoxia and an increased level of lactate in 1891. BOOM! We have the association that we all love and know. Lactate = inadequate tissue oxygenation. Great! As a trainee we get taught that this means badness, which it almost certainly does. What we/I (often) fail to do is go back to the books and actually make an effort to understand the physiology that this relates to. Brace yourselves and bear with me….I will attempt to succinctly describe the physiology of lactate. A lot of the physiology info below is adapted from a great paper by Bakker et al. This parrot is no more. It has ceased to be. It’s expired and gone to meet its maker. This is a late parrot. It’s a stiff. Bereft of life, it rests in peace. If you hadn’t nailed it to the perch, it would be pushing up the daisies. It’s rung down the curtain and joined the choir invisible. This is an ex-parrot. The human body undergoes a number of cellular mechanisms to supply this incessant demand for ATP. 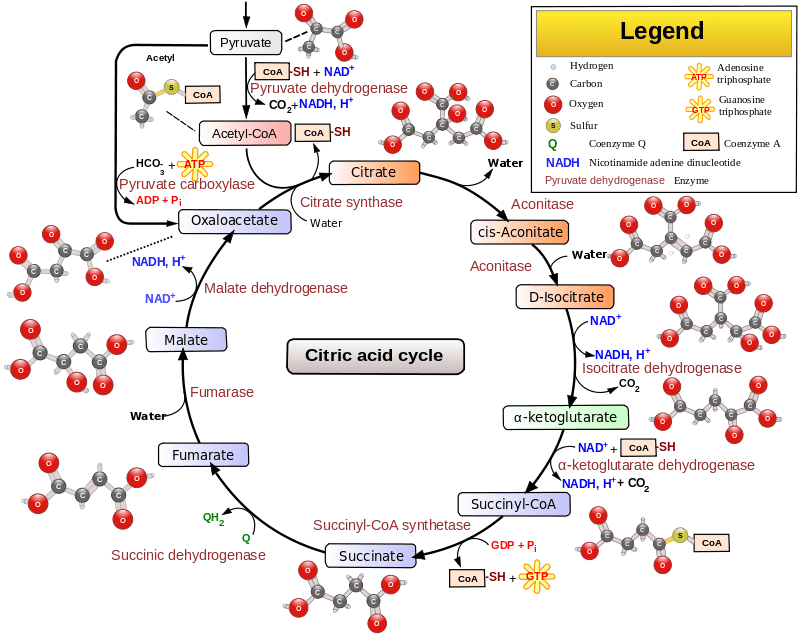 Glycolysis, the citric acid (Krebs) cycle and the electron transport chain are all key physiological processes that we all should have learnt about at medical school…..but probably didn’t. As I’m writing this I am becoming increasingly aware of my short fallings as a student! We create ATP in both aerobic and anaerobic conditions. Got it? Yeah me neither. So what on earth is this?! It basically shows that glucose can be broken down to generate ATP and pyruvate. You will (maybe) remember that NAD+ and NADH are involved in the electron transport chain….but let’s ignore them for now. Glycolysis was an early evolutionary mechanism that evolved when the levels of oxygen in the air weren’t what they are now. This is how primitive cellular organisms generated ATP. So as a byproduct we now have some ATP (whoop whoop), some NADH, but also some pyruvate. Glycolysis occurs in both aerobic and anaerobic conditions; it is the first step in both aerobic and anaerobic respiration. Salbutamol causes an increased rate of glycolysis…interpret lactate in the asthmatic who has been smashed with a ton of nebs with caution. In fact all Beta-2 Adrenoceptor Agonists will result in an increase in glycolysis. In conditions where there is plenty of oxygen, pyruvate is oxidised into Acetyl-CoA, which subsequently enters into the citric acid, or Krebs cycle. So again, like glycolysis, the Krebs cycle produces some ATP. However, a lot more NADH is generated through this process than in glycolysis. This NADH is subsequently utilised in the electron transport chain. In aerobic conditions the NADH and FADH produced enters into the electron transport chain, which combined with the process of oxidative phosphorylation, results in a net gain of 34 ATP per 1 molecule of glucose. This is is an efficient system for producing energy and that’s partly why the human body favours an oxygen rich environment. Most of these reactions occur in the mitochondria, and this is how poisons such as cyanide halt ATP production, and essentially asphyxiate the mitochondria. Well isn’t that great? I haven’t mentioned lactate once. So where does it come into all this? Well, so far we have seen the pathway to produce energy that occurs after glycolysis, providing there is an oxygen rich environment. So what if there isn’t?! Anaerobic respiration is a different beast. 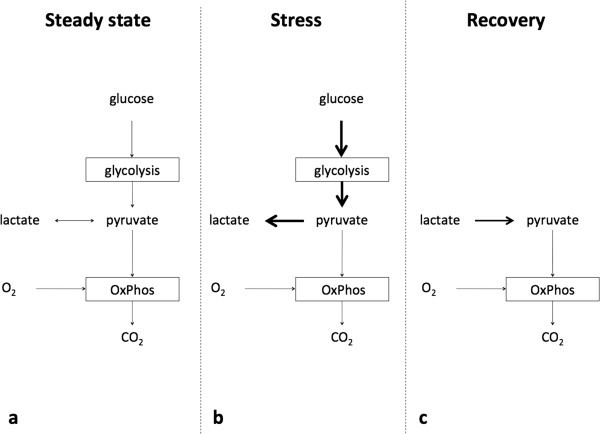 This diagram, taken from the Bakker paper, shows the relationship between pyruvate and lactate in different physiological conditions. In conditions where there is insufficient oxygen to supply the mitochondria to support the Krebs cycle/oxidative phosphorylation, a state of anaerobic respiration occurs. In anaerobic respiration, there is insufficient oxygen to facilitate the Krebs cycle/Electron Transport Chain/Oxidative Phosphorylation system of ATP generation. Oxygen works as an electron acceptor, which allows NADH/NAD+ to continue being recycled and thus permitting the formation of ATP. In the absence of oxygen, cells rely solely on glycolysis. This increase in glycolysis creates an increase in pyruvate. This increase in pyruvate causes a problem, as it is not able to be fully metabolised. In order to support the oxidation and reduction of NADH to NAD+ and back, in anaerobic respiration NAD+ regeneration is reliant on the reduction of pyruvate to lactate. This is known as lactate fermentation. NADH/NAD+ are essential to the regeneration of ATP. Consider sprinting: the demand for ATP in the muscle tissue is high. In high intensity exercise, such as sprinting, there quickly reaches a point whereby oxygen delivery is unable to fund the demands of the oxidative phosphorylation process. As a result, the muscle cells begins to rely on glycolysis and the reduction of pyruvate to lactate. As glycolysis is increased, so to is the amount of pyruvate produced. This pyruvate is unable to enter the Krebs Cycle and in order to produce more ATP it is reduced to lactate. This causes the accumulation of lactic acid. Once the demand (sprinting) has stopped, the excess lactate is cleared either by being oxidised back to pyruvate by well oxygenated tissue, or is used in the Cori cycle. The Cori cycle occurs in the liver and is responsible for gluconeogenesis whereby the lactate is converted to pyruvate and subsequently back to glucose. Some think this is how metformin can produce acidosis….by blocking the Cori cycle. Ed – or perhaps MALA has a different mech – see David Juurlink comment here. There is a dispute as to whether or not lactate causes acidosis. Some argue that the decrease in pH is due to the increase of hydrogen ions as a result of the hydrolysis of ATP to ADP. Glucose is a neutral molecule. In the conversion of glucose to pyruvate, 2 hydrogen ions are released…which you could argue would contribute to acidity, however these two hydrogen ions are subsequently absorbed in the formation of lactate. Therefore lactate can be considered a hydrogen acceptor and therefore something that does not contribute to acidosis. I think we’ll leave the physiology alone for a bit. So how is all of the above relevant to the patient in front of you, who in all likelihood has not just been sprinting? There are a number of clinical scenarios in which people get particularly twitched about lactate. First and foremost is sepsis. The debate at the Sepsis Smaccdown is what has prompted me to ruin my life a little and bother to (re)learn all of the above. Traditionally we have been taught that lactate in sepsis is a result of global inadequate tissue perfusion. A state of hypoperfusion causes a relative hypoxic environment for tissues, which then are forced to create ATP via glycolysis – which we have seen causes a rise in lactate. Furthermore, hypoperfusion of the liver results in decreased clearance via the Cori cycle. This makes sense. As a result lactate clearance has been viewed as a treatment goal in the septic patient. The rationale being that if the lactate is going down then tissue perfusion must be improving. This is a central tenet of early goal directed therapy. There are some very knowledgeable and intelligent people who disagree with the idea that a raised lactate is a result of inadequate tissue oxygenation. Mystical beings Paul Marik and Rinaldo Bellomo are advocates of this idea. Their argument is that an increase in lactate in sepsis and other shock states is a result of the stress response. Adrenaline triggers a hypermetabolic state in which glycolysis is accelerated. In such a state, all the pyruvate generated by the increased glycolysis is unable to be metabolised by the Krebs cycle, and as we have seen above, is reduced to lactate. Furthermore, a heart in a shocked state may even use lactate as a substrate for its energy supply, in which case driving lactate down may even be harmful and compromise the cardiac performance. If I was going suggest one paper that everyone should read it would be the paper by Marik and Bellomo. A conclusion of this paper is the suggestion that the initial reduction of lactate seen in the treatment of septic patients is actually due to the attenuation of the stress response and not from increased lactate removal. Perhaps it is better to view lactate as a marker of badness and not as an endpoint of treatment. I think it is clear that we do not fully understand lactate in sepsis and perhaps never will! What is important is to understand the spectrum of environments in which lactate is produced. An individual who is sprinting and a septic patient will both generate lactate via glycolysis, but the mechanisms which drive this increase in glycolysis are very different. There are numerous studies that conclude that an elevated lactate in the trauma patient is a prognostic marker. Unfortunately I have been unable to find studies that examine why lactate is raised in trauma, but it is feasible to postulate that it is again as a result of the stress response. The catecholamine surge in response to traumatic injury will presumably trigger an increase in glycolysis. But consider the use of tourniquets and REBOA…there will be tissues that receive no blood supply and in such tissues will presumably rely on anaerobic respiration. Perhaps the badness of lactate in trauma is a result of a hypermetabolic and hypoxic/hypoperfused state. This is a quick overview to stop and reconsider what we are really seeing when we look at a lactate result. If you are Emergency/Critical Care physicians then we should know more, perhaps even describing ourselves as lactatologists (Ed – not sure about that Rich). We look at lactates all day every day, but I for one know that my understanding only scratches the surface. It represents badness, but the hows and whys are less clear. My aim of writing this was to encourage everyone to take a little time out to think about this. Go forth and read the evidence, I would love to know which bits I have got wrong and your opinions and thoughts on the matter! Have a look at these great resources too for more on this topic. Listen to Scott’s pre-emptive SMACC back on the EMCRIT site. Previous: Previous post: JC The REVERT trial: Dip or doom for SVT in the Emergency Department? How do we know that both mechanisms don’t contribute to lactogenesis? Hypoperfusion induces a stress response as well! And that is worth treating. But how to combine all these variables correctly? Nobody really knows but it probably helps to know how they interact and the multiple variables involved in causation. And regarding metformin-associated lactic acidosis…. There is also evidence that high lactates that fail to clear are a poor prognostic marker in sepsis and trauma. It probably has some use in guiding the initial resuscitation (ED) but diminishes in relevance in the latter phase (ICU) due to multiple factors unrelated to tissue oxygenation that are causing it to remain persistently elevated. Marik and Bellomo’s model of lactic acidosis also fits in with how salbutamol (albuterol) causes lactic acidosis above and beyond that expected in children with asthma. But how to contextualise this in the ED setting is a bit more difficult and there is substantial selection bias. These were patients in which the intensivist had already decided needed pressor support. The admission lactate in their study group was 2.6 mmol/L. Hardly what I would consider highly abnormal compared to the values observed in some of the septic patients we see in the ED. By this point, they probably also would have received some fluid resuscitation, declared themselves as non-responders and very well commenced on pressors before transfer to the ICU. Marik and Bellomo defines lactate clearance as when lactate has been completely normalised. To me this is a straw man argument because it would assume that clinicians would not normally tolerate some persistently mild increase in lactate values after resuscitation. In conclusion, there is nothing to suggest that highly elevated lactate values in shocked patients is in some part related to hypo perfusion and require steps to address it. On the hand, following initial resuscitation and IMPROVEMENT of parameters it would be folly to persist super-oxygenation in the pursuit of completely normal values. But this principle could be followed for any number of physiological parameters traditionally used to evaluate tissue oxygenation. Thanks for all your comments, Derek. One thought about tourniquets and REBOA causing ischaemic tissue due to lack of arterial inflow causing anaerobic metabolism (and ischaemic bowel as a similar entity) – if there’s no inflow due to arterial occlusion how is there venous outflow? Especially when a tourniquet tight enough to occlude arteries will be compressing every vein. And if there’s no venous outflow, how does the lactate built up in these hypoperfused tissues make it back into the circulation to be picked up in the blood tests? Because not only is there a heart pump centrally but also a muscle pump peripherally. I agree with you completely. Any effective haemostatic device should, in theory, prevent both arterial and venous flow. In the initial stages of resuscitation the metabolic sequelae of such devices may not be evident in any blood tests. However, once the REBOA balloon is let down, or the tourniquet is removed I was speculating that one may expect to see evidence of ischaemic tissue in the blood tests. This may be hours down the line after initial resuscitation. Thanks for your comment and observation! If only theory and observation agreed with one another…. Great article. One problem is, that every young aspiring doctor learns is “if you have lactate, start giving fluids”. And then we have our daily positive fluid balance. I think we have to see all these data as a whole and correlate them. I work in a NCH intensive care unit, we experience hier a lot of patients with raised lactate. They do receive huge amounts of dexamethasone (surgeons’ wish). I read an article about Cardio patients, and there was a correlation between dexa and lactate. Do you happen to know why? Again, great piece of work ! Glad you enjoyed the article! We definitely have to see the data as a whole and correlate accordingly. Not one prescription fits all. I don’t know about dexamethasone and lactate, but I would speculate that maybe it’s related to insulin intolerance and as a sequelae, hyperglycaemia.